Kiev or Kyiv (Ukrainian: Russian: ) is the capital and largest city of Ukraine, located in the north central part of the country on the Dnieper River. The population in July 2013 was 70062847200000000002,847,200 (though higher estimated numbers have been cited in the press), making Kiev the 8th largest city in Europe. The citys name is said to derive from the name of Kyi, one of its four legendary founders (see Name, below). During its history, Kiev, one of the oldest cities in Eastern Europe, passed through several stages of great prominence and relative obscurity. The city probably existed as a commercial centre as early as the 5th century. 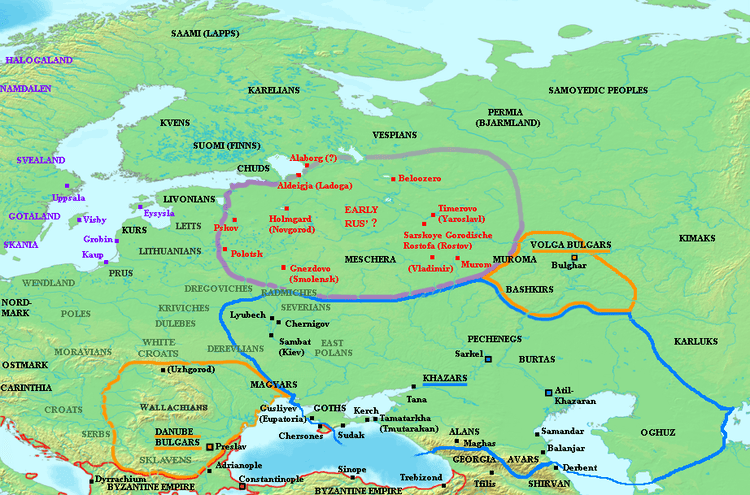 A Slavic settlement on the great trade route between Scandinavia and Constantinople, Kiev was a tributary of the Khazars, until seized by the Varangians (Vikings) in the mid-9th century. Under Varangian rule, the city became a capital of the Kievan Rus, the first East Slavic state. Completely destroyed during the Mongol invasion in 1240, the city lost most of its influence for the centuries to come. It was a provincial capital of marginal importance in the outskirts of the territories controlled by its powerful neighbours; first the Grand Duchy of Lithuania, followed by Poland and Russia. The city prospered again during the Russian Empires Industrial Revolution in the late 19th century. In 1917, after the Ukrainian National Republic declared independence from the Russian Empire, Kiev became its capital. From 1919 Kiev was an important center of the Armed Forces of South Russia and was controlled by the White Army. From 1921 onwards Kiev was a city of the Ukrainian Soviet Socialist Republic, which was proclaimed by the Red Army, and, from 1934, Kiev was its capital. During World War II, the city again suffered significant damage, but quickly recovered in the post-war years, remaining the third largest city of the Soviet Union. Following the collapse of the Soviet Union and Ukrainian independence in 1991, Kiev remained the capital of Ukraine and experienced a steady migration influx of ethnic Ukrainians from other regions of the country. During the countrys transformation to a market economy and electoral democracy, Kiev has continued to be Ukraines largest and richest city. Kievs armament-dependent industrial output fell after the Soviet collapse, adversely affecting science and technology. But new sectors of the economy such as services and finance facilitated Kievs growth in salaries and investment, as well as providing continuous funding for the development of housing and urban infrastructure. Kiev emerged as the most pro-Western and pro-democracy region of Ukraine where parties advocating tighter integration with the European Union dominate during elections. There is little historical evidence pertaining to the period when the city was founded. Scattered Slavic settlements existed in the area from the 6th century, but it is unclear whether any of them later developed into the city. 8th-century fortifications were built upon a Slavic settlement apparently abandoned some decades before. It is still unclear whether these fortifications were built by the Slavs or the Khazars. If it was the Slavic peoples then it is also uncertain when Kiev fell under the rule of the Khazar empire or whether the city was, in fact, founded by the Khazars. The Primary Chronicle (a main source of information about the early history of the area) mentions Slavic Kievans telling Askold and Dir that they live without a local ruler and pay a tribute to the Khazars in an event attributed to the 9th century. At least during the 8th and 9th centuries Kiev functioned as an outpost of the Khazar empire. A hill-fortress, called Sambat (Old Turkic for "High Place") was built to defend the area. At some point during the late 9th or early 10th century Kiev fell under the rule of Varangians (see Askold and Dir, and Oleg of Novgorod) and became the nucleus of the Rus polity. The date given for Olegs conquest of the town in the Primary Chronicle is 882, but some historians, such as Omeljan Pritsak and Constantine Zuckerman, dispute this and maintain that Khazar rule continued as late as the 920s (documentary evidence exists to support this assertion – see the Kievian Letter and Schechter Letter.) Other historians suggest that the Magyar tribes ruled the city between 840 and 878, before migrating with some Khazar tribes to Hungary. According to these the building of the fortress of Kiev was finished in 840 by the lead of Ke? (Keve), Csák and Geréb, the three brothers, possibly members of the Tarján tribe (the three names are mentioned in the Kiev Chronicle as Kyi, Shchek and Khoryv, none of them are Slavic names and it has been always a hard problem to solve their meaning/origin by Russian historians. Their names were put into the Kiev Chronicle in the 12th century and they were identified as old-Russian mythological heroes). During the 8th and 9th centuries, Kiev was an outpost of the Khazar empire. However, being located on the historical trade route from the Varangians to the Greeks and starting in the late 9th century or early 10th century, Kiev was ruled by the Varangian nobility and became the nucleus of the Rus polity, whose Golden Age (11th to early 12th centuries) has from the 19th century become referred to as Kievan Rus. In 968, the nomadic Pechenegs attacked and then besieged the city. In 1000 AD the city had a population of 45,000. During 1169, Grand Prince Andrey Bogolyubsky sacked Kiev taking many pieces of religious artwork including the Mother of God icon. In 1203 Kiev was captured and burned by Prince Rurik Rostislavich and his Kipchak allies. In the 1230s the city was besieged and ravaged by different Rus princes several times. In 1240 the Mongol invasion of Rus led by Batu Khan completely destroyed Kiev, an event that had a profound effect on the future of the city and the East Slavic civilization. At the time of the Mongol destruction, Kiev was reputed as one of the largest cities in the world, with a population exceeding 100,000 in the beginning of the early 12th century. In the early 1320s, a Lithuanian army led by Gediminas defeated a Slavic army led by Stanislav of Kiev at the Battle on the Irpen River, and conquered the city. The Tatars, who also claimed Kiev, retaliated in 1324–1325, so while Kiev was ruled by a Lithuanian prince, it had to pay a tribute to the Golden Horde. Finally, as a result of the Battle of Blue Waters in 1362, Kiev and surrounding areas were incorporated into the Grand Duchy of Lithuania by Algirdas, Grand Duke of Lithuania. In 1482, the Crimean Tatars sacked and burned much of Kiev. In 1569 (Union of Lublin), when the Polish–Lithuanian Commonwealth was established, the Lithuanian-controlled lands of the Kiev region, Podolia, Volhynia, and Podlachia, were transferred from the Grand Duchy of Lithuania to the Crown of the Kingdom of Poland, and Kiev became the capital of Kiev Voivodeship. In 1658 (Treaty of Hadiach), Kiev was supposed to become the capital of the Duchy of Rus within the Polish–Lithuanian–Ruthenian Commonwealth, but the treaty was never ratified to this extent. Kept by the Russian troops since 1654 (Treaty of Pereyaslav), it became a part of the Tsardom of Russia from 1667 on (Truce of Andrusovo) and enjoyed a degree of autonomy. None of the Polish-Russian treaties concerning Kiev have ever been ratified. In the Russian Empire Kiev was a primary Christian centre, attracting pilgrims, and the cradle of many of the empires most important religious figures, but until the 19th century the citys commercial importance remained marginal. During the 18th and 19th centuries city life was dominated by the Russian military and ecclesiastical authorities; the Russian Orthodox Church formed a significant part of Kievs infrastructure and business activity. In the late 1840s, the historian, Mykola Kostomarov (Russian: ), founded a secret political society, the Brotherhood of Saint Cyril and Methodius, whose members put forward the idea of a federation of free Slavic people with Ukrainians as a distinct and separate group rather than a subordinate part of the Russian nation; the society was quickly suppressed by the authorities. Kiev was the historic cultural centre of the East Slavic civilization and a major cradle for the Christianization of Kievan Rus. Kiev retained through centuries its cultural importance and even at times of relative decay, it remained the centre of primary importance of Eastern Orthodox Christianity . Its sacred sites, which include the Kiev Pechersk Lavra (the Monastery of the Caves) and the Saint Sophia Cathedral are probably the most famous, attracted pilgrims for centuries and now recognized as a UNESCO World Heritage Site remain the primary religious centres as well as the major tourist attraction. The above-mentioned sites are also part of the Seven Wonders of Ukraine collection. 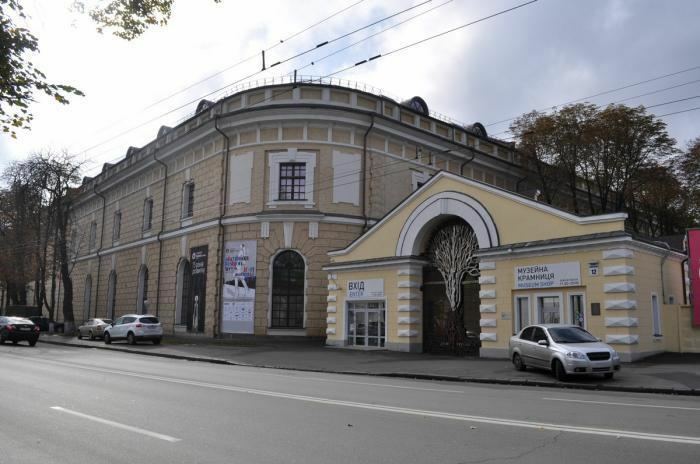 Kievs theatres include, the Kiev Opera House, Ivan Franko National Academic Drama Theater, Lesya Ukrainka National Academic Theater of Russian Drama, the Kiev Puppet Theater, October Palace and National Philharmonic of Ukraine and others. In 1946 Kiev had four theatres, one opera house and one concert hall, but most tickets then were allocated to "privileged groups". Other significant cultural centres include the Dovzhenko Film Studios, and the Kiev Circus. The most important of the citys many museums are the Kiev State Historical Museum, Museum of the Great Patriotic War, the National Art Museum, the Museum of Western and Oriental Art, the Pinchuk Art Centre and the National Museum of Russian art. In 2005 Kiev hosted the 50th annual Eurovision Song Contest as a result of Ruslanas "Wild Dances" victory in 2004. The Museum of the Great Patriotic War is a memorial complex commemorating the Great Patriotic War located in the hills on the right-bank of the Dnieper River in Pechersk. Kiev fortress is the 19th-century fortification buildings situated in Ukrainian capital Kiev, that once belonged to western Russian fortresses. These structures (once a united complex) were built in the Pechersk and neighbourhoods by the Russian army. Now some of the buildings are restored and turned into a museum called the Kiev Fortress, while others are in use in various military and commercial installations. The National Art Museum of Ukraine is a museum dedicated to Ukrainian art. The Golden Gate is a historic gateway in the ancient citys walls. The name Zoloti Vorota is also used for a nearby theatre and a station of the Kiev Metro. The small Ukrainian National Chernobyl Museum acts as both a memorial and historical center devoted to the events surrounding the 1986 Chernobyl disaster and its effect on the Ukrainian people, the environment, and subsequent attitudes toward the safety of nuclear power as a whole.